Jesse King, No. 11 Ohio State midfielder, vs. No. 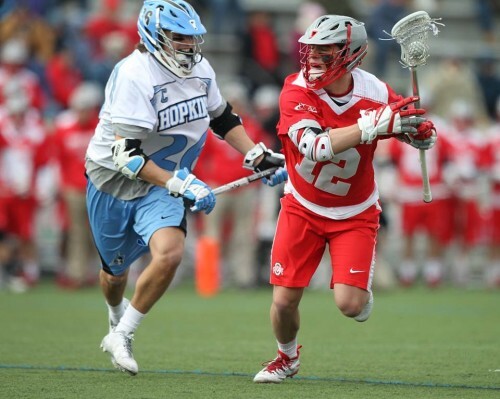 3 Maryland, 11 a.m.
King has been the face of Ohio State lacrosse for the past few seasons and now that his career is coming to an end, he has an opportunity to shock the lacrosse world. The Buckeyes have won six of their last seven games, the only loss coming against the nation’s top team, Notre Dame. OSU’s other two losses were each by one goal. At the start of his junior year, pundits put King in the Tewaaraton conversation. He didn’t prove them right, but Saturday presents a chance for a statement win and if it were to happen, it would surely be King leading the way. Nick Marrocco, No. 13 Georgetown goalie, vs. No. 10 Virginia, 1 p.m.
Marrocco has the second-most saves per game in all of Division I with 13.58. Meanwhile, Virginia has the 11th-best scoring offense. Something’s got to give, and it will likely come down to Marrocco. We all know about UVA’s heavy hitters in Greg Coholan, Owen Van Arsdale, Ryan Tucker, Zed Williams and Ryan Lukacovic, all of whom have at least 33 points this season. Even though Marrocco makes so many saves, the Hoyas allow 10.67 goals per game — 41st-best in D-I. UVA’s shooters will certainly look to capitalize on the mediocre defense so it will come down to Marrocco between the pipes. Notre Dame is a team on a mission. After falling short in last year’s national championship game, the Fighting Irish have made statement win after statement win this season. And Saturday presents another opportunity in another No. 1 vs. No. 2 matchup. When these two teams played last year, Notre Dame escaped with an 11-10 victory. Matt Kavanagh had three goals and Sergio Perkovic had two. Enter Mikey Wynne. The freshman attack has added another dimension to the UND offense making it nearly impossible to defend. Wynne is third in the country in shooting percentage and has scored seven goals in the past three games. The Fighting Irish have yet to lose a game in regulation this season and that will continue on Saturday if Wynne performs to his capabilities. Seth Oakes and Connor Fields, No. 8 Albany attack vs. No. 9 Yale, 7 p.m. When you think of Albany lacrosse, you think of Lyle Thompson. Can’t blame you. Who doesn’t? But games like this come down to the supporting cast. Everyone knows what Thompson can do — and so does Yale. The gameplan every week for Albany’s opponents is to limit Thompson, and it works… kind of. He leads Division I in assists per game. Oakes (35 goals) and Fields (39 goals) have been the benefactors. So while everyone else in the world is watching Thompson, keep an eye on Oakes and Fields because they’re the ones likely to receive a pass at any split-second.